It was, right up until it wasn’t, the sort of tournament that can crumble a draft stock. Virginia’s De’Andre Hunter, a projected lottery pick, had had a mediocre (by his standards) tournament, averaging 11.25 points per game over his previous four, and failing to score more than 14—still below his season average. The sophomore guard was no less talented for his extended cold stretch, but the chill had reached the point where it was impossible not to notice, and difficult not to wonder if it meant anything, coming as it did under greater pressure and against tougher competition. He’d have one more chance to change that perception, in the national championship game, against a Texas Tech defense that promised to be suffocating, and would be focused on him. He went 1-for-8 from the field in the first half. Sometimes, you can do everything right and it just doesn’t happen for you. “I was aggressive in the first half, I believe,” Hunter said, “but my shots just weren’t falling.” Sometimes, it can not happen for four and a half games. Sometimes, you just need a little reminder from a trusted teammate that results shouldn’t influence the process, if the process is sound. Ty Jerome took Hunter aside at halftime and delivered that message. “Ty just told me he loves aggressive me,” Hunter said. And so Hunter came out still shooting. And so he scored 22 of his career-high 27 points in the second half and overtime of Virginia’s 85-77 win, including the three biggest points of all. 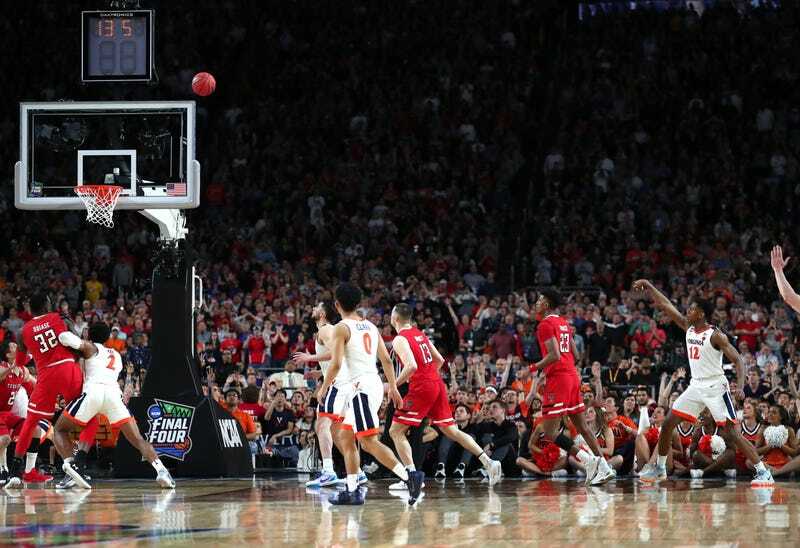 He was 4-of-5 from beyond the arc, none more crucial than the game-tying three with 12.9 seconds left in regulation. It was Jerome whose aggression made it happen. Coming off a screen, the junior guard was able to peel Jarrett Culver, the Red Raiders’ own future lottery pick, away from Hunter in the corner. Jerome kicked the ball out to Hunter who had seemingly endless time to gather, think, and shoot. Hunter made life absolutely miserable for Culver, holding the wing to 5-of-22 shooting, including 0-for-6 from three. Bennett couldn’t stop raving about Hunter’s two-way game, and that’s the crux of it, isn’t it? How many players in the country could’ve shut down a future top-10 pick while going off for 22 points in 25 minutes against the team rated No. 1 in defensive efficiency in the country? Maybe a few could’ve. Only De’Andre Hunter did. That’s why they’ll be calling his name at the NBA Draft in June, and you won’t have to wait particularly long to hear it.